This fishing rod measures 1.6m (5.2 feet) long when extended, and 30.5cm (12 inches) when retracted. It is made of carbon fiber, lightweight and durable. The strong plastic fish-shaped shell can protect the rod from being damaged. It is compact and convenient to carry wherever you go. Extended length: Approx. 5.2 feet; Retracted length: Approx. 12 inches. Carbon fiber rod is lightweight and durable. 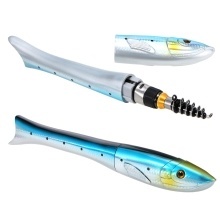 Fish-shaped plastic shell protects the rod from impact. Fits your pocket, glove box, briefcase, backpack, easy to carry. Note: Fishing reel in the picture is not included.